1. 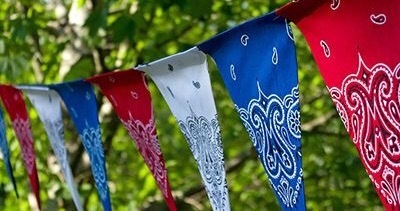 Cut the bandannas into triangles or rectangles (whatever shape you desire). 2. Hot glue the tops of the shapes onto the twine and hang inside or outside. Strawberry layer: Stir 1 cup of boiling water into the strawberry gelatin until gelatin is fully dissolved. Add in ½ cup of cold water and the chopped strawberries. 1. Arrange the jars at an angle in a muffin tin. 2. Put flour or uncooked rice in the wells to hold the jars in place. Gently spoon equal amounts of the strawberry gelatin mixture into each of the jars. Refrigerate until firm, about 30 to 45 minutes. 1. With the jars still at an angle in the muffin tin, spoon equal amounts of the ice cream mixture into each of the jars. 2. Refrigerate until firm, about 20 to 30 minutes. 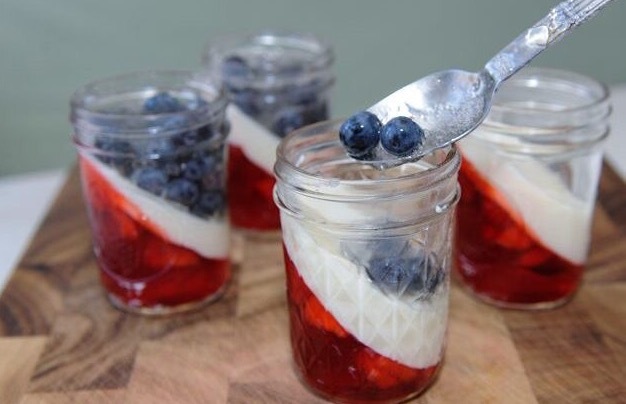 Blueberry layer: Sprinkle 1 tablespoon of unflavored gelatin evenly over 1/4 cup of cold water in a bowl. Wait 2 minutes to allow the gelatin to absorb the water. Add in ½ cup of boiling water. Stir until the gelatin is dissolved and then mix in ½ cup of sugar. Lastly, add the 1 ½ cup of blueberries. 1. Refrigerate the blueberry mixture in the bowl until it thickens to the consistency of a gel . 2. Take the jars out of the muffin tin and set them upright. 3. Spoon equal amounts of the blueberry mixture into each of the jars. Refrigerate until firm. 4. Garnish with whipped cream and serve. Game: Test Your Patriotic Knowledge! 1. What is the capital of Colorado? 2. The Mardi Gras celebration is held in the French Quarter of where? 3. Which state became the 50th state, admitted on August 21, 1959? 4. Name the six states that make up New England. 5. Coca-Cola was founded in which capital city? 7. Which state is famous for earthquakes? 8. What state is known for having crocodiles? 9. Also known as Mary Hayes McCauley, what woman carried water to men in the Battle of Monmouth during the Revolutionary War in 1778? 10. Who was the leader of the Underground Railroad, which brought many slaves to freedom?